A small but impressive rush. 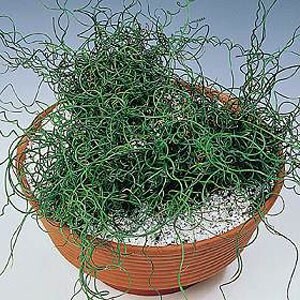 Dark green, wire-like foliage grows in a tangle of curious spirals, resembling corkscrews. A warm season, irregular clump forming ornamental grass. Flowers are sparse, emerging from the sides of the foliage. Effective as a single plant in a clay pot or other container, 10-12 inches in diameter. A great pond or bog plant. Prefers very moist to wet conditions in full sun to part shade. Protect in hot climates by providing shallow water 1-6" over the crown. Refresh the foliage yearly by cutting back the old stems in late winter; bright, new greenery will emerge in spring. This duplicates what happens naturally each in its northern most range, where the frost kills its greenery back to ground level. COMMON NAME: Corkscrew Rush SPREAD: 12 - 18'' FLOWER COLOR: yellow-green to pale brown SOIL/WATER: Requires consistently moist soil; do not let dry out between watering.